“Whenever I set off on any sort of journey I fall off the radar. I think there are a lot of people like me. Who aren’t around, who’ve disappeared. They show up all of a sudden in the arrivals terminal and start to exist when the immigrations officers stamp their passport, or when the polite receptionist at whatever hotel hands over their key.” The woman speaking, perpetually traveling, is one of many voices animating the one hundred sixteen parts of Olga Tokarczuk’s Flights. These pieces build to something off the radar, a far cry from novels or short story collections in the conventional sense. If anything, they’re like people in transit, abstractions shot through with alarmingly distinctive features, demanding to be recognized in order to exist: the woman walking through the airport in rainboots, the child clutching a stuffed iguana on the bus. Like these people, the accumulation of fragments in Flights invites new perspectives and startling revelations. This woman’s voice is ever-present in Flights, which won Tokarczuk the first of her two Nike Prizes after its publication in 2007 and, in its crisp English translation by Jennifer L. Croft a decade later, the Man Booker International Prize. Her meditations are the meat of this book, focusing on her discomfort with travel, how all people on journeys become strangers in strange lands. More than that, she ponders how the world itself is unstable, warping beyond our personal definitions into something much vaster, more unknowable. In the book’s opening, she details an episode from her childhood, the moment she realized the daytime and nighttime worlds exist separately –the realization makes her feel trapped, alone: “my own presence is the only thing with a distinct outline now, an outline that quivers and undulates, and in so doing, hurts. And all of a sudden, I know: there’s nothing for it now, here I am.” To open the book with such an observation is to raise the question about how many thousands of universes exist inside our own, about how many lives we can inhabit as we move through those universes. To read Flights is to attempt answering that question. The narrator’s willingness to rewrite her identity, to fashion for herself a home when none exists, is a probing portrait of how we all think, alone and together. Loneliness—how we do and don’t belong to a place and a people—is one of the most compelling threads in Flights, and Tokarczuk is unafraid to plumb the depths of solitude in travel, the inherent isolation of a figure in motion, not just in our modern, hyperconnected age, but across human history. The narrator meets a man who detests sightseeing alone, as he cannot share the beauty of his experiences with someone; she notes he would have made a terrible religious pilgrim of old. The message is clear: no matter how much we might believe that modernization has changed society, we cannot erase the feelings of alienation and ostracization that have always haunted humanity and always will. Tokarczuk is tireless in her examinations of these ideas, peering through microscopes, telescopes, and magnifying glasses to lay the human experience bare. Where some novels might choose one or two angles to explore their central preoccupations, Tokarczuk chooses many, and the variegated approaches here gives Flights a rich texture. Much of the praise this book receives, including from the Man Booker International committee, is for the variety of voices present in Flights. Indeed, the book pinwheels from somber to wryly funny to frantic with ease, and the myriad tones work together to build a layered, thought-provoking text. All these snippets coalesce into a collage, and the result poses many questions but provides few answers. 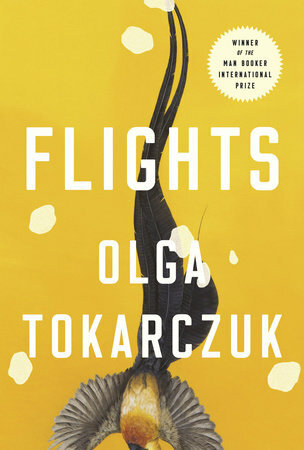 Flights unquestionably earns its place in the fragmentary tradition: like many modernist writers, Tokarczuk is interested in using fiction to learn more about the mind (unsurprising, since she has a degree in psychology and worked as a psychologist for some years) by representing it as a constant and discontinuous torrent of images and feelings. Critics have also long drawn the connection between fragmentary novels and periods of cultural turmoil, sensibilities shifting beneath people like soil liquefacting in an earthquake. That Flights is so preoccupied with travel—boundaries, homes, identities—in a world that grows smaller and more reactionarily nationalistic with each passing day feels like no accident, even if the book was originally published in Poland over ten years ago. Comparisons to Sebald and Kundera have also been drawn for Tokarczuk’s use of innovative structures and tendencies to build philosophical treatises masquerading as fiction, but the writer that came to mind as I read Flights was fellow Polish author Hanna Krall, whose novel Chasing the King of Hearts was released stateside last year (and was published one year before Flights in Poland). Like Tokarczuk’s book, Hearts amasses its narrative weight through tiny vignettes, short scenes spanning a page or two at most, and the prose is often startingly straightforward, aiming only to document, not decorate or distract. Krall’s book, which details true Holocaust events, pairs this prose with fragmentary scenes that give the book a clinical feel, detached and desensitized to the pain and terror of the story. The fragments starting and stopping create a jarring pace, allowing readers reprieve while insisting they continue. Tokarczuk scatters dozens of other short pieces among her first-person narrative insights, some of which unspool across thirty or forty pages. Many of these are preoccupied with mortality and the carnality of existence: one recurring story features a surgeon, post-amputation, operating on his own severed limb to discover the Achilles tendon; another takes the form of a series of letters from a woman trying to reclaim her father’s body, which has been put on display by his former employer. These moments are often gruesome, executed with delicacy and vivid detail; like Krall, Tokarczuk’s dancing between these and less bloody scenes ensures readers can adequately digest the implications each story carries without being shuttled through connective tissue that might otherwise dilute the power of each piece. That this book is so full of blood and guts is no surprise: there is something inherently carnal about transit. Bodies, themselves objects of transit for the ethereal human consciousness, are delicate, and how can we not be reminded of that fragility when we—and everything in us, all the blood and organs and the electricity buzzing in our brains—move at the speed of cars or airplanes, at seventy-five or five hundred seventy-five miles per hour, our insides waiting to crash against our outsides and rupture at an abrupt stop. Flights is proof positive that travel has the power to unravel a person not only mentally, as the narrator frequently attests, but physically. Tokarczuk is interested in the disintegration of a body, how travel can break it into fragments. In one piece, she details the excavation and eventual transportation of Chopin’s heart from his body after his death. What could have easily been left to anecdotal history in Flights instead becomes a powerful parable for the significance of the body, for the meaning we ascribe to its corporeal state even once our spirits, our souls, our minds have dimmed. Another sequence follows Dr. Blau, a man obsessed erotically with the preservation of organs; here, the taboo disassemblage of the body, the categorization and containment of parts unseen, holds a power over him that living sexual partners cannot provide. Even our recurring first-person narrator has a fascination with bodies in pieces—in several fragments, she visits museums filled with relics, slivers and slices of saints’ bodies preserved for pilgrims to pray to, holiness carved into chunks and disseminated across the earth. To that end, Flights also includes twelve maps, scattered throughout the text. These diagrams include no explanation, no caption or connection to the fragments they interrupt. Some maps are in Russian, Japanese, or Latin; others are unlabeled (though a list at the back of the book gives the name of each). Without context, these images are disorienting, working against the very purpose which humans create maps for: to orient themselves in the world. Ultimately, it feels like a continuation of the book’s disdain for human efforts to exercise control over the ever-changing world; during her diatribe about travel writing, our narrator says “no book ages quite so quickly as a guidebook,” and the same can be said for maps, especially as our understanding of the world changes (one map, included near the end, is drawn to show Odysseus’s travels in the world as the Ancient Greeks understood it) or as we change the world, exerting our willpower to redirect rivers and dynamite tunnels through mountains. Perhaps what makes Flights so fascinating is the purposeful lack of a throughline, the absence of a clear point of takeoff or point of arrival. Tokarczuk herself has referred to her writing as “constellation novels”—constellations, another attempt by humanity to impute meaning to the randomness of the natural world—and says her intention with this text was to gather together disparate stories without providing them a larger architecture, allowing readers to make their own decisions about significance. In 2015, Tokarczuk was awarded the International Bridge Prize, which recognizes efforts to create networks of understanding between the peoples of Europe. Though Flights is intentionally indescribable, perhaps the very philosophy that won Tokarczuk her peace prize is what unifies the text as a whole: to recognize that the lines that have historically divided and destroyed humanity are imaginary, that people are everything and nothing like what we say they are, that we must stop ascribing significance to the arbitrary. Indeed, in one fragment in the last third of Tokarczuk’s book, we observe the practice of beached whale-watching: “suspicious shamans would come down to the dying whale and perform rituals over it, followed by amateur photographers and thrillseekers. A teacher from a village school brought her whole classroom, and the children were tasked with drawing ‘The Whale’s Farewell.’” The whale, merely another unhomed traveler, becomes a vehicle for people’s fears and expectations; unlike the humans in the book’s other narratives, the whale doesn’t have the agency to travel elsewhere, to create its own identity and history: even in responding to the whale, by bringing a chair to the beach to watch it die or trying to coax it back to the water, people rewrite their identities to fit comfortably into yet another version of the world, one where a whale has washed ashore. The whale is an apt metaphor for Flights as a text: a work upon which people can project their interpretations and insecurities, a gateway into the thousand realities, the thousand performative identities each person creates as they move through the world. Flights is a humanistic text, one unafraid of sorrow and pain, nor of wisdom and humor. Tokarczuk’s writing is endlessly penetrating and revelatory. Unlike the maps and guidebooks it scorns, it never attempts to reach easy definition or clear meaning, and it’s through this refusal to answer its own questions—about who people are or what the world is like—that it gains its power, its awestriking scope and fractal, refractive insights. At the end of the book, our recurring narrator boards a plane: “The flight attendants, beautiful as angels, make sure we’re fit to travel . . . that smile of theirs holds—or so it strikes us—a kind of promise that perhaps we will be born anew now, this time in the right time and the right place.” How can we ever pin down people or the universe when they are constantly reborn? Jonathan Wlodarski is a recent graduate of the Northeast Ohio MFA. His fiction and translations have been published in Confrontation, Third Coast, and Fairy Tale Review, among other venues. Banner image: Photograph by Bill Abbott.